Camping out by the fire in their own back garden and more. The young couple who live in this lovely bungalow in the Woodland Heights were ready to update the landscaping after having worked on the inside of their home. Front yard wrapped with azaleas and shades of green. For a soft traditional southern garden look. BEFORE, we moved these Indian hawthorns to the east side of the house. 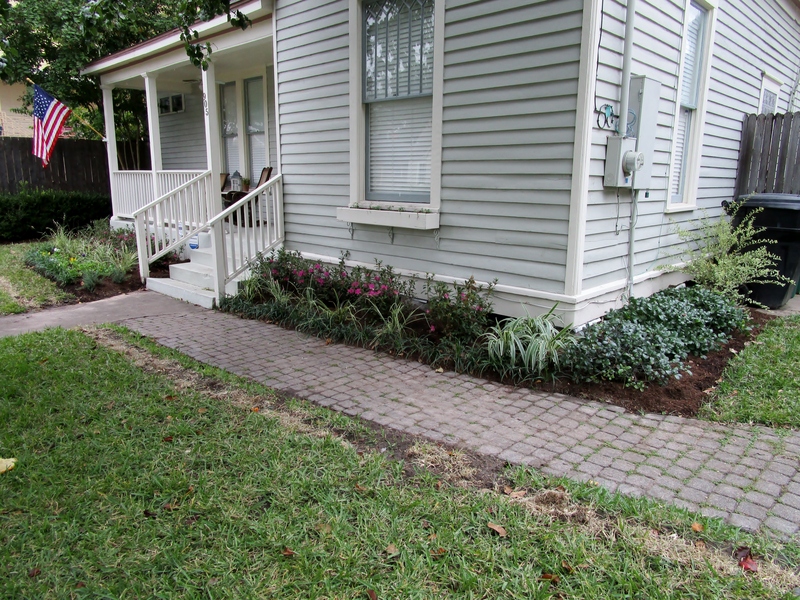 We kept the front garden simple and re-purposed some of the plants and added irrigation to the entire property. 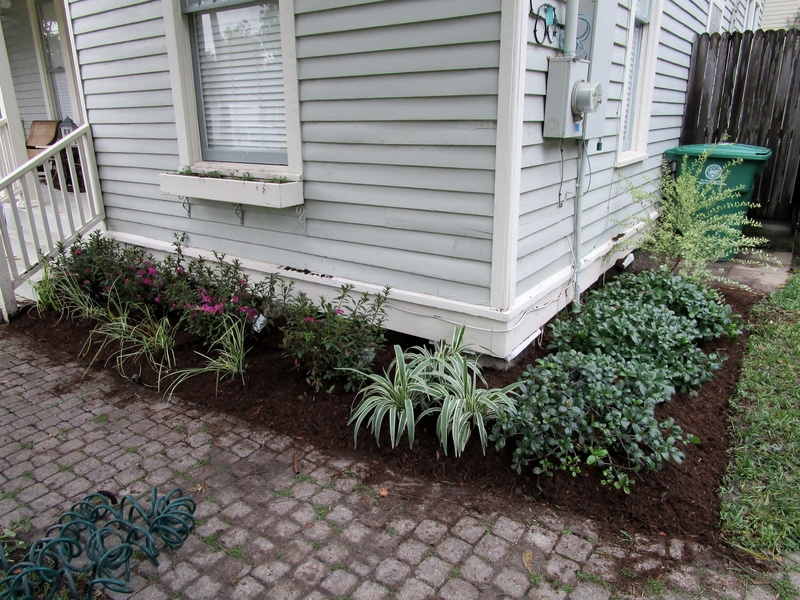 There are now azaleas across the front and a space for annuals in the bed in front of the porch. The beds are layered and wrap around the front of the home. 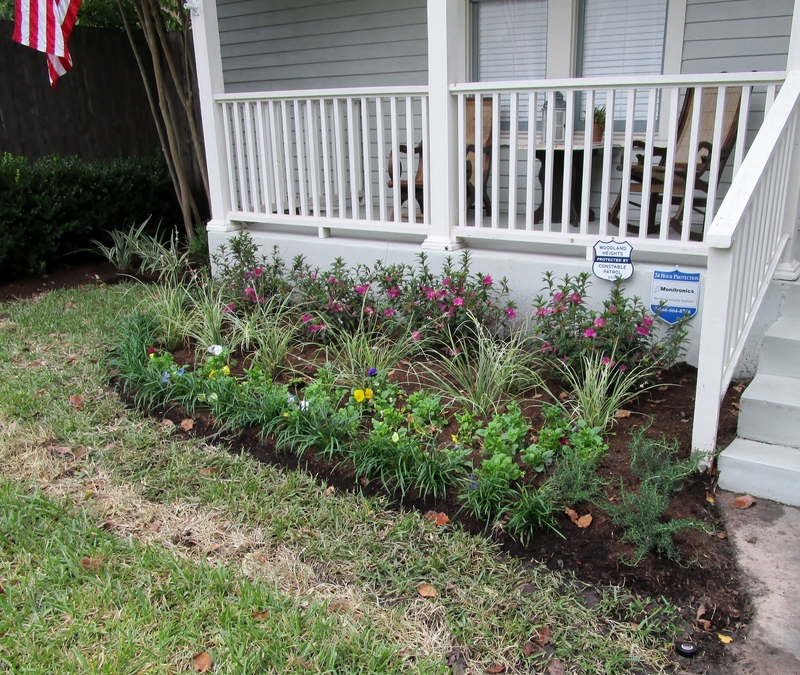 We planted Variegated Shooting Star Lilies in front of the Encore azaleas. They bloom, with many little star shaped white flowers on long stems, spring thru summer and they dance in the breeze when they catch the wind. The majority of the plants are installed. Notice that the bordering Liriope and annuals are not in although the bed is mulched. 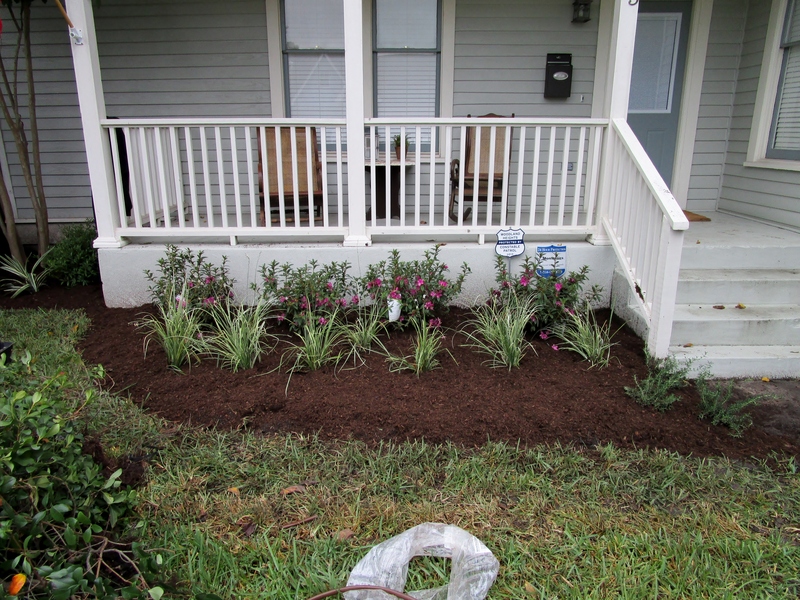 We prefer to plant 4″ pots after the beds are mulched. The beds, which we deepened, have no hard edging. Instead we put a border of Big Blue Liriope, a very common border in southern gardens, along the edge of the bed which we cut with a slight trench. I think it is a softer more old fashioned and charming look that really suits this style of planting and bungalow. The brown strip in front of the bed is where we ran the irrigation pipe. The space for annuals is small and would require two flats at the most. 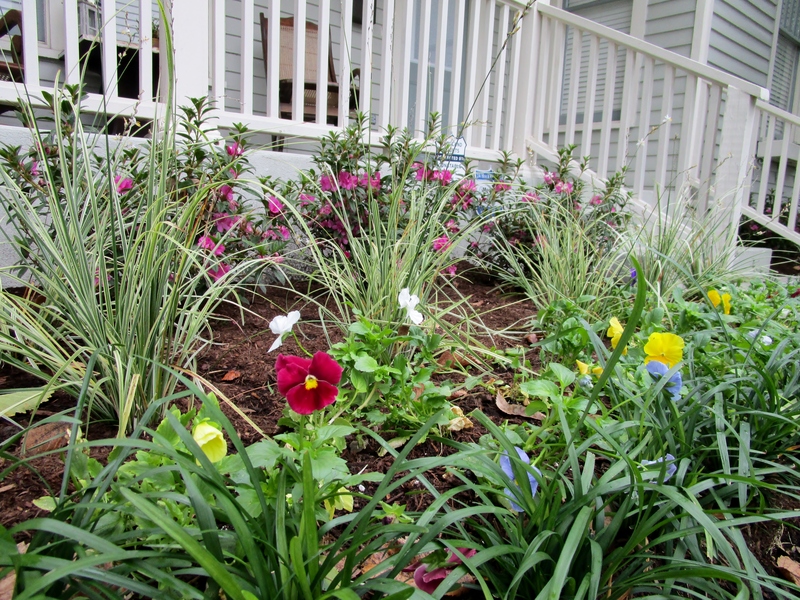 The Pansies should last until spring and then there are a variety of annuals to chose from. The bed faces south but has partial shade from a large tree in the front yard. In the summer they could plant the sun tolerant Impatiens or Caladiums to stay in keeping with the southern garden theme . 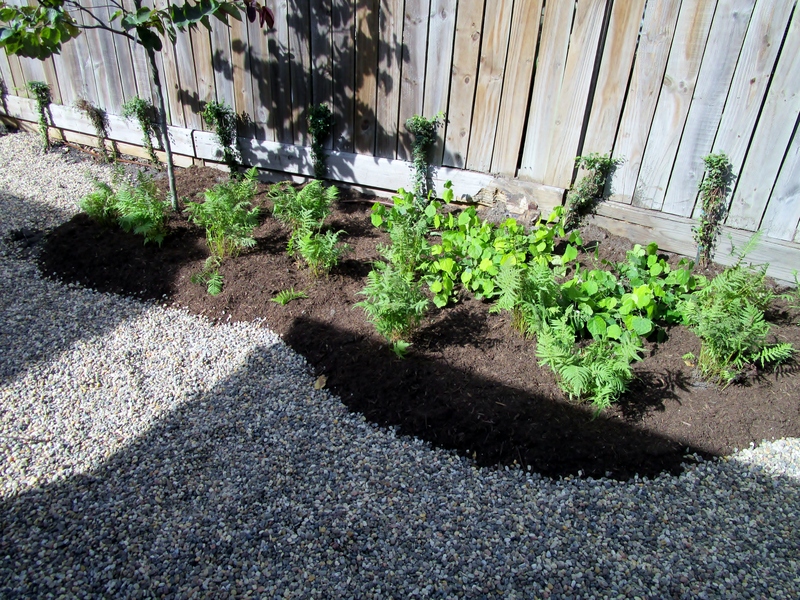 Planted and mulched (but not quite cleaned up). The privet is already stretching to cover the trash can! On the east side of the front walk we planted more Encore azaleas (a wonderful re-blooming cultivar) and Shooting Star lilies. Near the corner are a trio of dianella as a bright spot between the azaleas and the Indian hawthorn. 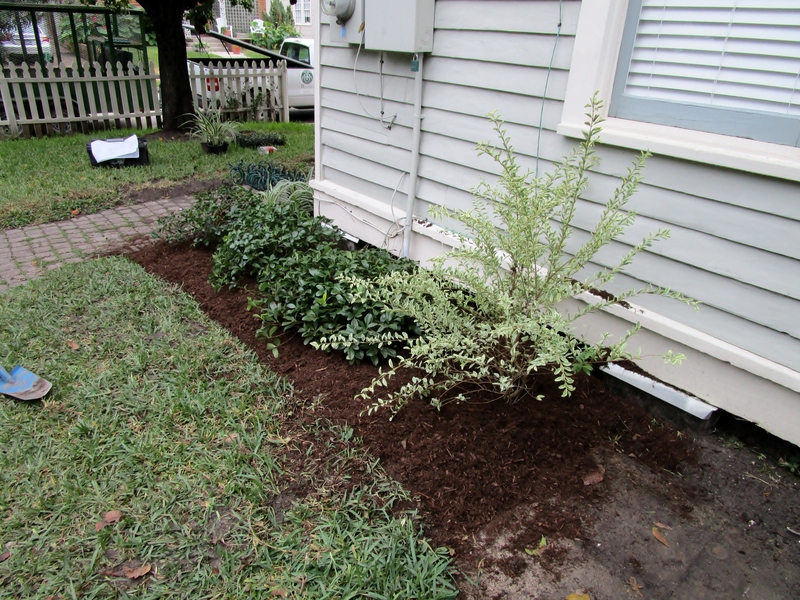 We continued the bed around the corner and added a place to transplant the Indian hawthorns and a Variegated privet which will become a living screen for the neighboring trash can. View to the street with our truck and trailer parked out front. 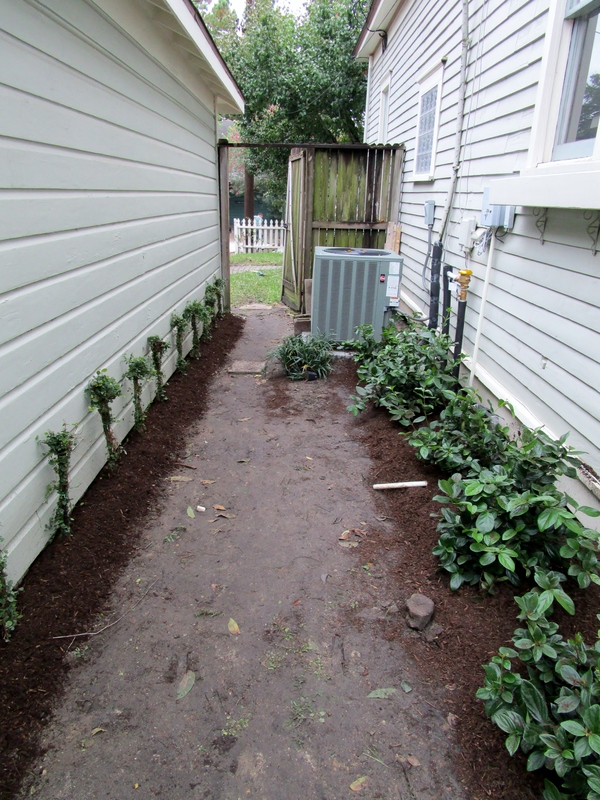 The walkway between the house and garage was lifeless so we added fig ivy to grow on the garage to create a green wall and viburnum as foundation planting along the house, which can deal with minimal light. 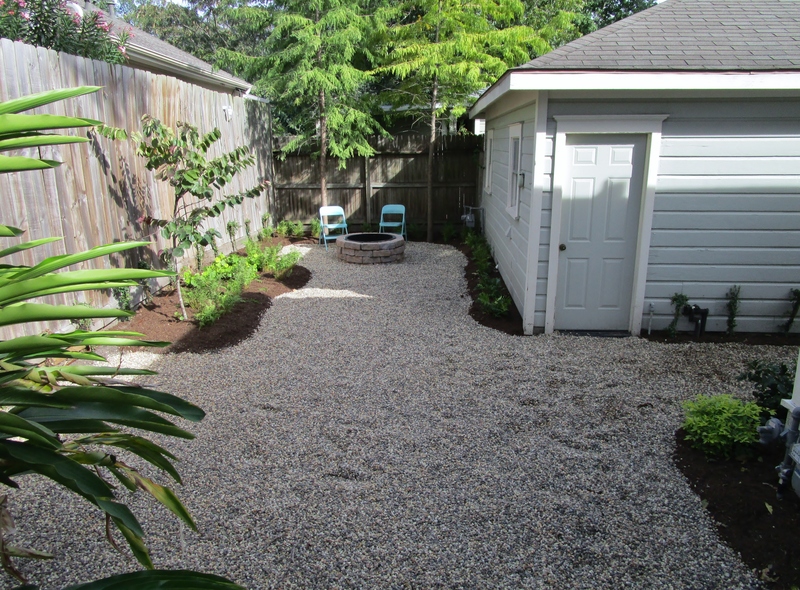 The homeowners removed the mix of old cement pavers and were able to get rid of them through a local neighborhood site. We are always happy to hear that materials are re-purposed and don’t end up at the dump. Planted, but before the gravel. I am looking forward to seeing this as a green wall someday. 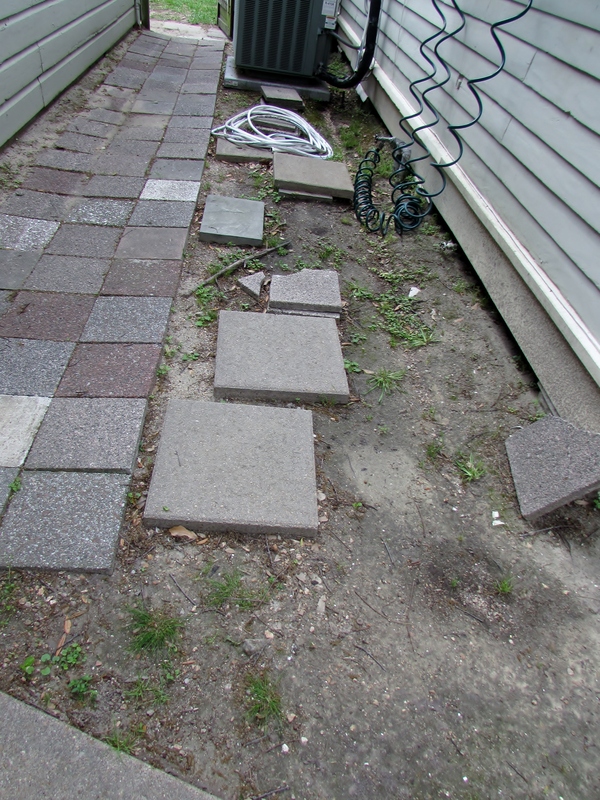 BEFORE: the deck built by the homeowner and more concrete squares. 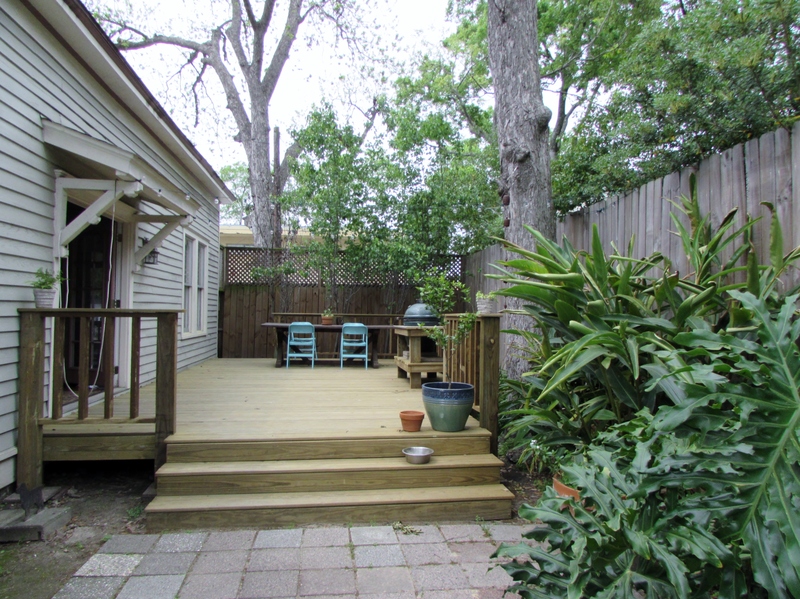 In the back yard the homeowners had already built a beautiful deck but felt the need to expand their entertaining space. They had tried to grow lawn but it was too shady and kept failing. Perhaps with the oak removed grass might have worked now but we had already decided to create a place to sit around a fire ring which really seemed a more fun use of the space! 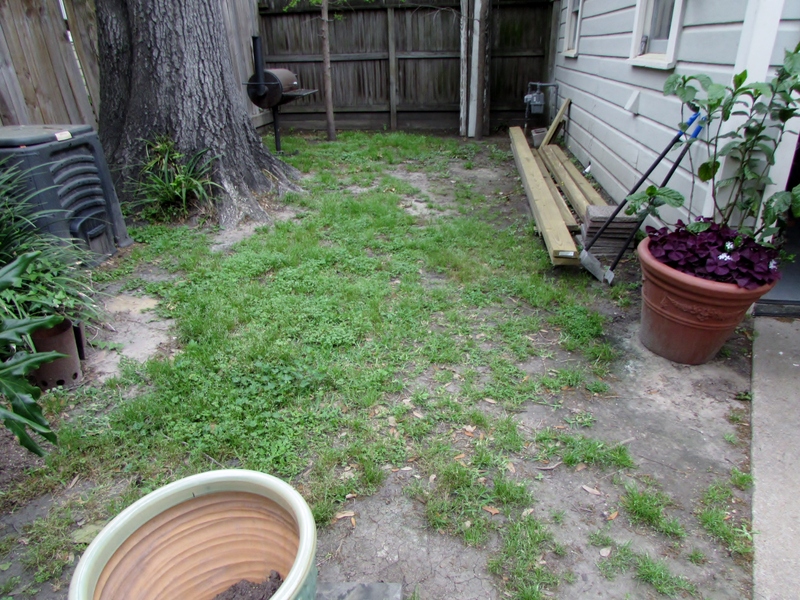 BEFORE, an aging oak and patchy ‘grass’. In order to accommodate their budget we suggested gravel, which also worked in to the relaxed campground feel that we wanted to create. We removed some plants to make a space for a picnic table. They had the large oak checked out by an Arborist and decided to have it removed because it was not healthy. 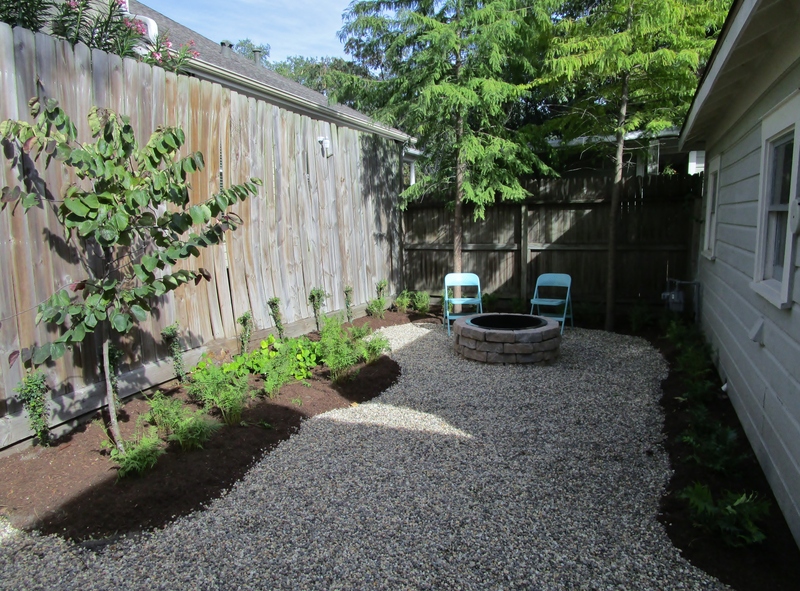 We added a Forest Pansy Redbud which is a more appropriate size for the space and has load of seasonal interest. 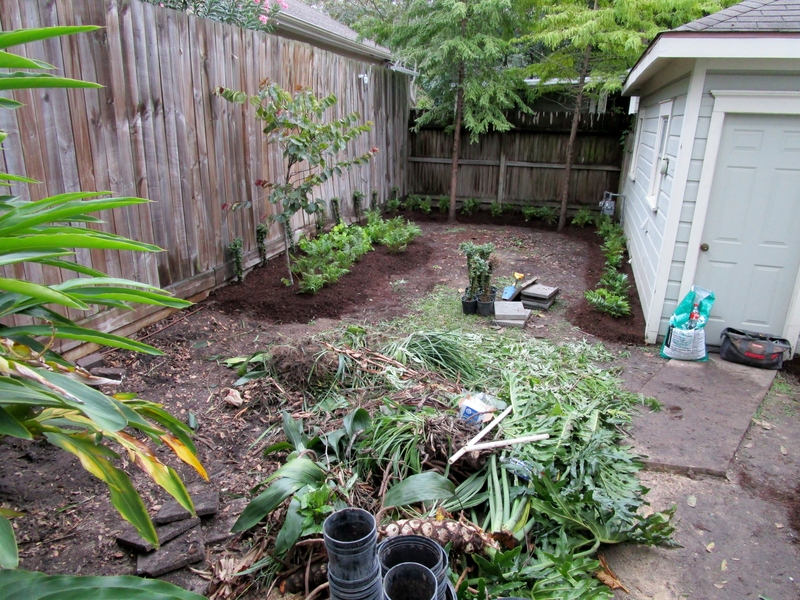 DURING: plant debris that was removed to make more room. There were two cypress trees at the far end and we surrounded them with wood fern to add to the woodsy feel. 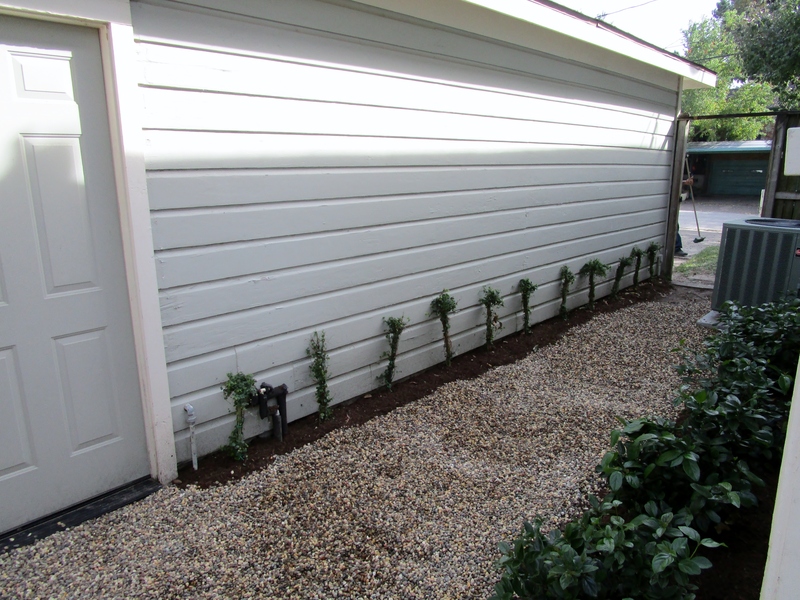 Holly fern is planted against the back of the garage and will fill in nicely but not take up too much space. 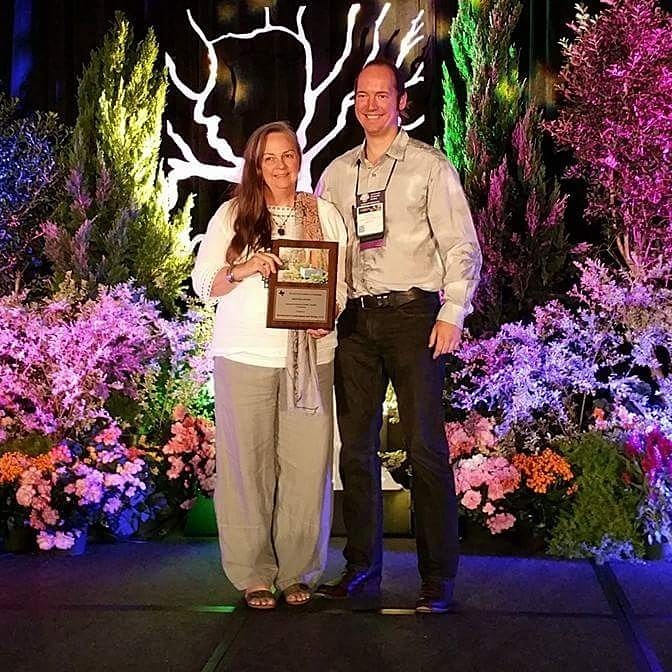 We look forward to receiving more photos as they live in the space and the plants fill in. The homeowners bought a fire ring kit and put it together before we installed the gravel. We suggested 3/8″ rainbow gravel on the design but they went out and found a 3/8″ rainbow gravel (that was even smaller than what we suggested) at a source we were not familiar with. We will be using it again, it is a perfect size. We don’t install weed barrier under our gravel. 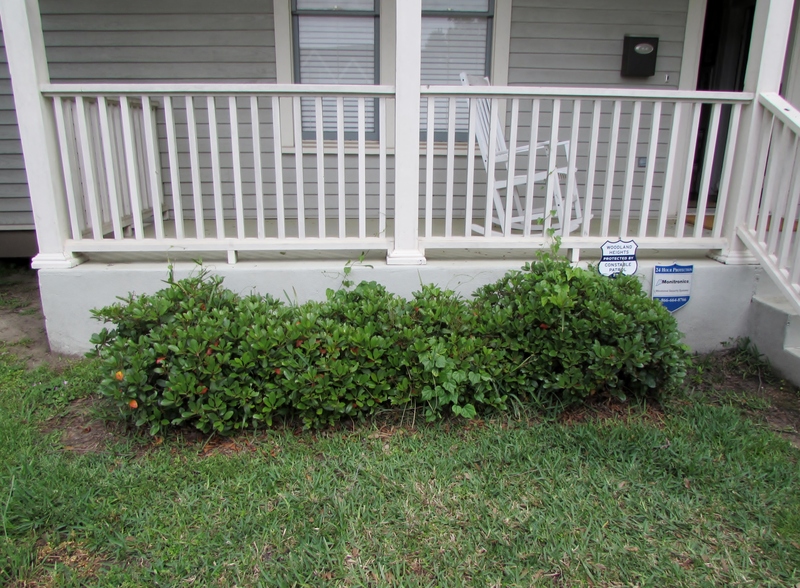 We have found that weed barrier breaks down within a few years and becomes frustrating for the client. Additionally, most of our weeds come from above. 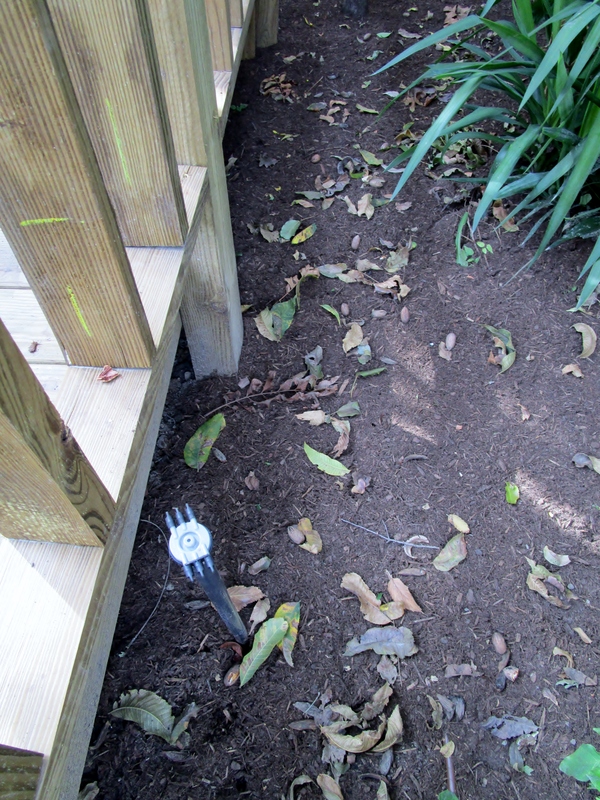 The birds, wind, rain, pets bring in many of the seeds and a barrier below does little, if anything, to stop the growth. Instead we install gravel at 3″ thick. This creates an environment inhospitable to seed-growth. Any weeds that do pop up are easy to pull out. Also, simply walking on the gravel (with the accompanying crunch that is pleasant to hear) will help macerate the young shoots of weeds trying to come through your gravel. AFTER: fire pit set up, along with a couple of chairs. A few more after shots to give you all the perspectives. Below is the area where the large oak was removed. I was hesitant to add too many plants here until the roots have had more time to decompose. We did plant White Turks cap which grows like a weed here in Houston. The white flowers are cool because they show up in the late evening sun, and even low-light evenings. Sorry about the shade! But it helps you understand the challenge in planting. View towards deck with house on left. On the bottom left the bright green plant is a Cuban Gold Durant. It does very well in shade and gives a nice contrast to the dark green viburnum. 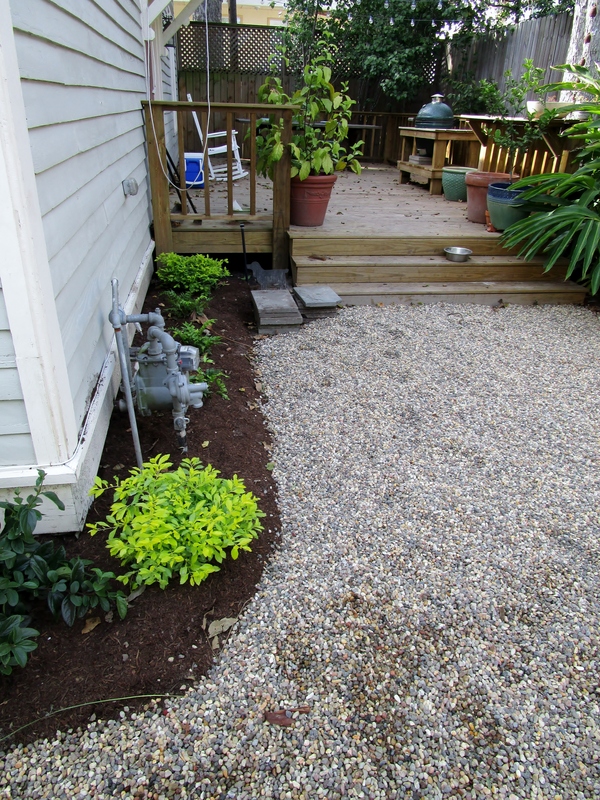 We also included an irrigation zone for their potted plants on the rear deck. Micro tubing can connect to the outlets to water pots up on the porch. This is very helpful for people who have busy lives and want low maintenance. It is also useful in our long hot summers where pots often need watering twice a day. And best of all you can have lovely potted plants and never worry about them drying out when you are out of town. 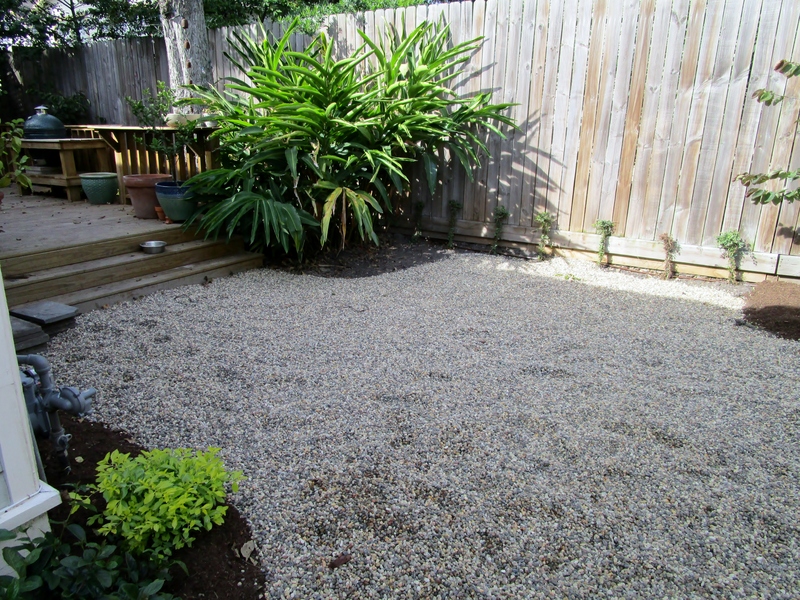 The gravel indents towards the fence to make room for the picnic table. 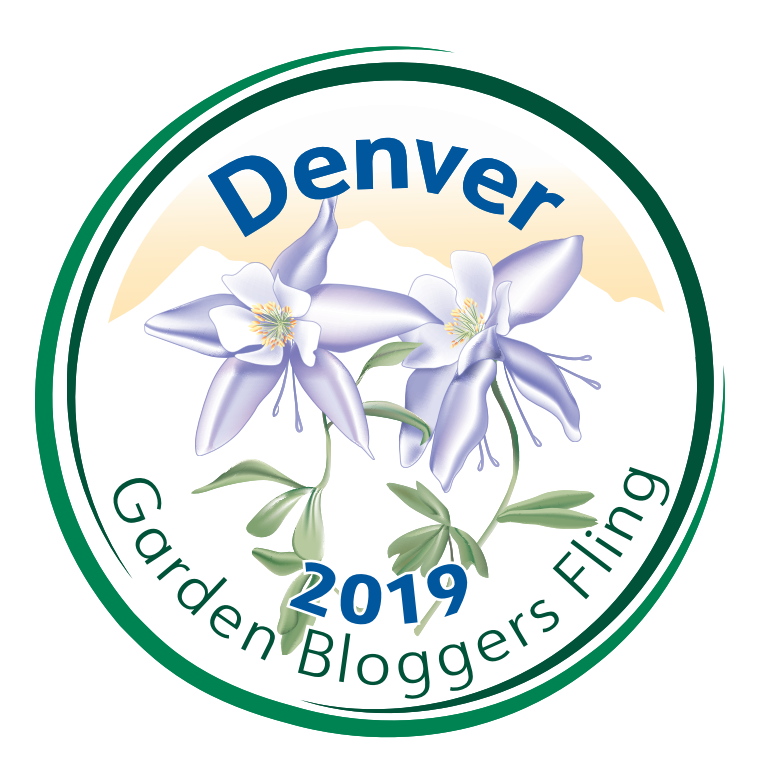 You can see in the photos that we planted fig ivy all along the back fence from the deck to the east corner to make a green wall and sound barrier. On this project we were working to meet all the clients needs and stay with in their budget. The space is both fun and functional and will be easy to maintain. Another great project! I love the idea of pots being automatically watered as I have many of them and in the summer watering them takes an hour or two every day! 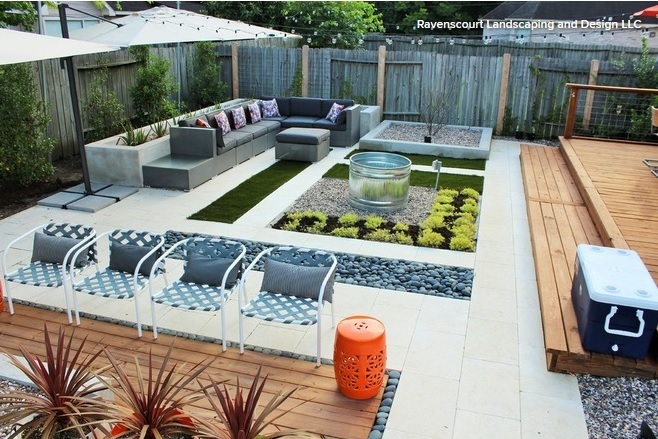 Do you put any sort of barrier between the gravel areas and the beds or does the gravel pretty much stay in place on its own? I always ask Shawn to give customers the option of a pot zone because the time people love to leave Houston is the middle of summer. I am sure the plants appreciate me looking out for them. We usually put a barrier, 10 gauge black steel edging or chop stone as a boundary border around beds. But that would have added to much to the price and not have the more relaxed feel or a woodland campground. The border might get a bit blurred but gravel tends to stay in its place. The cool thing is both mulch and gravel are easy to refresh. And the ferns should grow to the edge in time and hang over the gravel. I am sure this look is not for everyone but we have used in many times and it works well. I’m intrigued to hear that white Turk’s cap grows like a weed in Houston. It’s rarely seen or available in Austin. I found and bought three a couple years ago, and only one has survived in my garden, and it struggles. The red and pink Turk’s caps grow very well here, and are readily available as well. I wonder if the white just likes Houston’s extra 18 inches of rain? Pam, they are not common here but they grow fine. They do seem to like full sun and evenly moist soil. I get them from Treesearch Farms.